SUMMARY: Testing can be one of the most effective ways to build a value proposition for your product or service. But, where -- and how -- should marketers begin these productive testing campaigns? See which platforms marketers use most often to test value proposition, and share your thoughts and advice on these findings in this week’s chart. 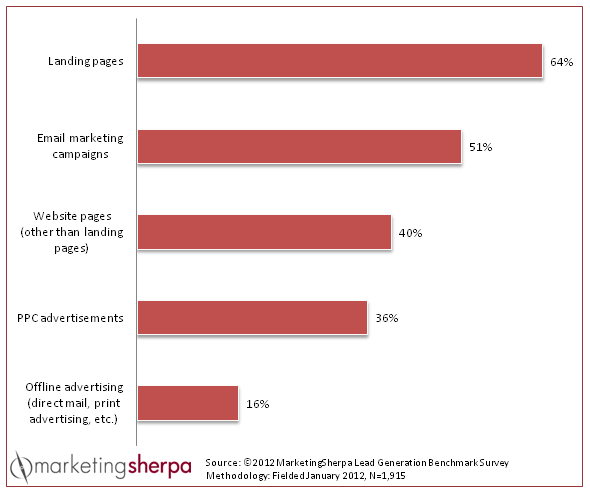 When MarketingSherpa launched this year’s Lead Generation Benchmark Survey, we wanted to learn more about the most effective means of testing value propositions. So, we asked the 31% of survey participants who test value proposition which methods they found to be most effective. While this chart was published previously, we chose to revisit the data to share some questions you should consider as you test your own value propositions. If you’d like to share your experience and advice as well, your peers can greatly benefit from your feedback. Share your top tips, tactics and advice based upon this marketing industry data on the MarketingSherpa LinkedIn discussion board, for a chance to be featured in a future blog post. The clear winner is the landing page. Marketers have a multitude of options when it comes to testing any content on their landing pages, including the value proposition. This flexibility allows marketers to identify the components of the page that generate a higher conversion rate, lower bounce rate and, ultimately, more qualified leads. Are organizations really testing value proposition? In the 2012 Lead Generation Benchmark Survey, we gave respondents an opportunity to select up to three of the above categories. This made us wonder how many of the respondent organizations actually conduct formal tests of value proposition, as opposed to those who answered based upon a more intuitive “feeling” rather than a strong empirical base. Do you actually conduct split tests on your value propositions, or make assumptions based on, for example, landing page analytics and conversion performance? Have time-honored lead gen practices decreased in testing value? The fact that landing pages and email marketing are the two dominant methods for testing value proposition comes as no surprise, as they've long been the top two choices for testing conversion factors. Offline and PPC testing ranked much lower. Have you used PPC testing to present different elements of value to an audience that may not necessarily know about your company? And have you found enough of a return on offline testing to justify its higher cost? What are your other thoughts on this data? What are we overlooking? Share your own analysis on LinkedIn for a chance to be published in a future blog post. Include your feedback as either a comment, or a link to a blog post where you offer advice based on this data. To see the feedback your peers posted about a previous Chart of the Week, read the recent MarketingSherpa blog post, "Email Marketing: 83% of CMOs says social media will affect email programs."